"Your top source for football officiating information"
Search our site by using our customized search engine. 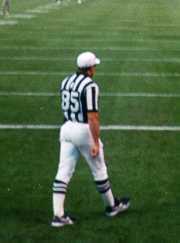 Referee Ed Hochuli steps onto the field during a 2001 preseason game. Hochuli worked Super Bowl XXXVIII last season. • 1/9: Wild Card Officials are posted under playoffs. Stay tuned for Divisional Round crews. • 1/4: Playoff Information Posted. Crews will be posted at a later date. Check out who officiated each game during this year's playoffs. Check out who officiated each game during the regular season. Create a user account in our message board and talk football officiating. Football Officiating Tips: Click to View or Add Text.